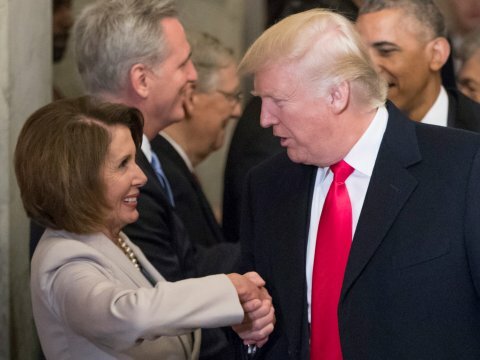 No, Mr. POTUS, Pelosi isn’t ‘bad for the country’; you are! Mr. President, I cannot let you get away with this nonsense you spouted on CBS News. Your belief that House Speaker Nancy Pelosi is “very bad for the country” is laughable on its face. Except that it ain’t funny. What’s “funny,” and my laughter is of the derisive kind, is that you say these things with a straight face. You, sir, are the one who is “bad for the country.” I hate saying that about the president of the United States, but I feel as though I must. Pelosi was controlling her Democratic Party congressional caucus. She was helping ensure that President Obama’s landmark Affordable Care Act legislation got passed by the House and eventually by the Senate. She was doing her job as a legislative leader. She is displaying her strong hand once again in this silly battle over The Wall and whether we should pay for it. Your ridiculous campaign promise that Mexico would pay for it has been exposed for what it is: utter nonsense. Yet you make these idiotic pledges anyway. You call Pelosi “rigid”? No, sir. She is standing behind her principles and is holding her caucus firm in its resistance to building The Wall. You contend you are ready to declare a “national emergency” where none exists on our southern border. You are prompting a legal challenge. You are intent on putting our military personnel to work as wall builders. Haven’t you heard your fellow Republicans urge you to resist this measure, that you are courting disaster? Previous PostTime of My Life, Part 15: Name-droppingNext PostGov. Northam, you have blown it!